Tennessee State Quarters are the 16th variety in a series of fifty design changes over a ten year period from 1999 to 2008. This Quarter was released into circulation on January 2, 2002. The reverse has three stars representing the three different regions in the state. The musical instruments symbolize the distinct music of that region. First, the guitar is for central Tennessee, the home of the state capital Nashville, as well as the capital of country music. Next, the fiddle represents Appalachian music of east Tennessee, and then the trumpet is for the blues that is prevalent in west Tennessee. 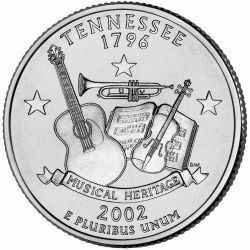 The reverse of the coin bears the inscriptions "TENNESSEE 1796", "MUSICAL HERITAGE", and "E PLURIBUS UNUM" along with the date of 2002.